One of my treasured LPs was from Chandos, ARBD 1156. It included a beautiful performance by Timothy Hutchins playing Vivaldi’s RV444 piccolo concertos with a sopranino recorder. There are numerous versions of this concerto to be had in this combination, such as the complete recorder concertos compilation on Naxos 8.553829 (see review), or Dan Laurin on BIS-CD-865 with the Bach Collegium Japan, now acclaimed for their Bach Cantata series with Masaaki Suzuki. I would normally defend the flute against the recorder in terms of dynamic and expressive potential, but in the case of these ‘piccolo’ concertos honours are about even. The sopranino recorder does a great deal of the work in reaching pure tones in high registers simply by virtue of its size. The same goes for the orchestral piccolo, but a degree or two more of technical intervention from the player makes this the more demanding and stressful of the two - though I have no doubt the recorder players will take issue with this point of view. Not that you would notice it particularly from the players on these recordings. Jean-Louis Beaumadier is a piccolo hero of our times even more today than when these recordings were made, and Philippe Pierlot is very much an equal partner in the double concertos. Jean-Pierre Rampal made his own Vivaldi recordings in the 1960s (see review), and the first four of these Saphir label concertos originally appeared on Calliope CAL 5630. These pieces are more chamber music than orchestral, and I’ve played Vivaldi concertos very effectively with only a string quartet for accompaniment. I suspect Rampal wouldn’t have had a huge amount to do as a conductor here, but despite sounding just a little dated these performances, his experience and musicianship still see these works coming up sounding pretty fresh. The string sound is warm and carries vibrato, but with a harpsichord filling out textures in the background and a decent balance between solo and orchestra these are recordings which are for the most part light and easy on the ear. As you would expect there is a shift in perspective with the last two concertos, recorded 18 years or so later. The stereo image is wider and the sound more transparent, but not so as to put the other recordings to shame. In all cases the bouncy rhythms and energy in the outer movements are entirely satisfactory, as is the expression in the slow central movements. The only real question is if you prefer the straighter purity of the sopranino recorder played by someone like Dan Laurin, or the more ‘fluty’ sound of these piccolos. I hadn’t been expecting to be so keen on these piccolo performances, but on listening properly they have grown on me each time I have returned to them. One or two very minor technical blemishes reveal just how tricky these works are to perform to perfection, but the emphasis here is virtuoso playing and musical expression full of human warmth and Vivaldi’s sense of impish fun. 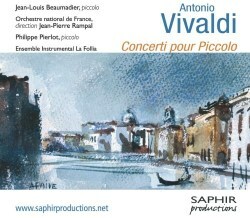 If you were ever wondering what a CD full of piccolo might be like, here is the very place to find out.